1. How To Make Coffee With a Stovetop Percolator? Brewing coffee can become a daily ritual especially when you are fully involved in the process. And using a stovetop percolator lets you actively participate in brewing your coffee. But what if you haven’t done it before? Fret not, because you just found an easy and straightforward guide to brewing good coffee with your stovetop percolator. Step 1: Prepare your percolator and other ingredients. This is a pretty simple step. Ready your percolator by making sure it’s absolutely neat and all the parts are available. Basically, a stovetop percolator will have an upper chamber with a lid, a funnel filter with a basket and a bottom chamber. You should have a grinder ready if you’re using whole coffee beans. But if you already have coffee grounds then you won’t be needing a grinder. Next is to make sure you have a measuring spoon, a coffee mug and clean water. Step 2: Grind your coffee beans. Make sure to set your grinder to coarsely grind the beans. Too smooth grounds will give a very bitter drink. Step 3: Fill the percolator. The amount of water you add will depend on the quantity of coffee you intend to brew. A standard measurement is 8 ounces of water for every one tablespoon full of coffee grounds. Having decided, pour the appropriate amount of cold water into the percolator’s water reservoir. Step 4: Add coffee grounds. Use the measuring spoon to add the corresponding amount of grounds to the basket. Remember this depends on the quantity of coffee you intend making. When this is done, couple the percolator, this shouldn’t be an issue but if it is, simply consult the manufacturer’s manual. Step 5: Place the percolator on the stove and monitor the brewing. With the percolator on the stove, turn the heat to medium-low and observe attentively. The heating process has to be slow so as to get the water very hot but not to boil. Once the water starts sputtering and making bubbles, adjust the heat so that it sputters once in about 2-3 seconds. Allow this percolating action to continue for some minutes (5-10 minutes), then turn off the stove. The longer the brewing time the stronger the coffee. Step 6: Pour and Enjoy your brew. Remove the percolator from the stove, open the lid and carefully remove the basket of used coffee grounds. Then pour the brew in your coffee mug and enjoy. 2. How To Make Percolator With an Electric Percolator? Using percolators may be an old-fashioned way of brewing coffee but that doesn’t mean you shouldn’t enjoy percolated coffee every once in a while. Especially when there are electric percolators that automate the process. And if you haven’t used one before, have no fear because it’s actually easier than you think. Follow the steps below and you’ll be amazed at how easy it is. Step 1: Ready your percolator. It’s important to brew with a neat percolator. And to make sure of this, gently uncouple the percolator and wash its parts. Clean water ( If you have distilled water, even better. This is important because water affects the taste of coffee ). Step 3: Grind the coffee beans. Set the grinder to coarsely grind the beans and if you’re using coffee grounds make sure they’re coarse. This is to ensure you don’t get a bitter brew and the grounds don’t end up in your coffee drink. Step 4: Fill the percolator with water. To brew good coffee, make sure you use the right measurement. Usually 8 ounces of water for every one tablespoon of coffee grounds. Step 5: Add the coffee grounds. Put the basket in place. Using the measuring spoon measure the accurate amount of coffee grounds (corresponding to the amount of water you poured into the percolator), place them in the basket and attach the lid. Step 6: Turn on the percolator. Plug in the percolator, turn it on and watch it percolate the coffee. And when it’s done pour yourself a cup of percolated coffee and enjoy. 3. How To Use Percolator With a Campfire? Camping shouldn’t mean abstinence from coffee. And if you’ve ever wondered how to use your percolator with a campfire? I have great new for you; it’s actually really simple. To enjoy hot coffee while camping, all you need are; coarsely ground coffee, water, percolator, fire and the steps below. Step 1: Light a campfire. First, you need to start the campfire. You don’t need an elaborate fire, dry leaves and a few logs of dry wood would suffice. Step 2: Fill the percolator. Open the percolator, pull out the basket and fill the bottom chamber with clean water. Make sure you don’t over fill it, about 8 ounces of water is enough for a cup of coffee. It’s a bit easier if your percolator has a “fill line” to help you gauge the water. Step 3: Add coffee grounds. Replace the basket, add a tablespoon full of coffee grounds and replace the percolator lid. For a good brew, the grounds should be coarse. Step 4: Place the percolator on the campfire. You can create a hole at the center of the fire and put the percolator there. Or you can place it near the fire. If there are flames you can hang it above them, making sure the flames do not directly touch the percolator. Be attentive and monitor the process. In a few minutes your coffee should be ready and served. 4. How To Clean a Percolator? Did you know that the neatness of your percolator affects the taste of your coffee? Yes, that’s right, one of the secrets of making great tasting coffee with a percolator is making sure it’s perfectly neat. This means washing it regularly. And that’s not all, frequently cleaning your percolator also keeps it stain-free, prevents clogs and generally extends the lifespan. Now if you’re wondering how to do this, worry not because it’s really not heard. Simply follow the few practical steps below and your percolator will be in great condition. Fill the percolator with water and add three spoons of baking soda. Turn on the pot and let it complete a percolating cycle. Allow the water to cool for a while. Using a brush, scrub the pot carefully till all visible stains fade away. Discard the water and rinse with fresh water. Prepare a solution of water and vinegar by mixing equal proportions of both in a bowl. Fill the percolator with the mixture. Turn it on, for the electric percolator. For the stovetop percolator, place it on a stove and turn on the stove. Allow the coffee pot to go through a percolating cycle. When it’s done, allow to cool, turn off the heat and discard the content. Refill the percolator with the solution you prepared and turn the heat. Let it perk for another few minutes and discard the content. In summary, repeat steps 2,3 and 4 thrice. Next, fill the percolator with clean water, turn it on and allow it to complete another percolating cycle. Discard the water, rinse thoroughly with some more clean water and your coffee pot will be as good as new. 5. What is the best grind size for percolators? The best grind size for percolators are undoubtedly medium-sized coarse coffee grounds and I’ll tell you why. First, percolators have a filter baskets with visible holes which cannot prevent finely ground coffee from ending up in your coffee drink. Percolating coffee requires that coffee grounds be exposed to heated water for a while, during which flavor and aroma are extracted from the grounds. With finely ground coffee this produces a drink with an awfully bitter taste due to over-extraction. An opposite effect is observed with overly coarse coffee grounds, the resulting brew is weak due to under-extraction. So, the ideal grind size is half way between fine coffee grounds and very coarse coffee grounds – and that is medium-sized coarse coffee grounds. There are different types of roast coffee beans. The light roast, the dark roast and varying degrees of medium roast. Using dark roast may result in a bitter brew or one with burnt flavor, while light roast coffee may produce a drink deficient in delicate flavor and aroma. This is to say that the best roast type is medium roast. Have you been wondering why your percolated coffee is always less than perfect? Would you like to uncover the secrets of making great coffee with your percolator? If yes, then sit tight and read on. Making coffee with a percolator is really very easy, despite that many loyal coffee fans still make mistakes. And most times these mistakes affect the taste of coffee resulting in a less than perfect coffee brew. The most common of these mistakes can be corrected by been a little more careful and attentive. Here are the top mistakes coffee lovers make while using percolators and how to avoid them. The ideal temperature for brewing coffee is between 92-96°C, yet some people erroneously believe that the water in the percolator should be allowed to boil. This is wrong and would most likely burn the coffee or over-extract the elements resulting in a very bitter brew. While using a stovetop percolator, it is important to allow the water to get really hot but never let it boil. Another apparent mistake is not accurately taking the correct measurements of the coffee grounds and water. Adding too much water or too little water or excess coffee grounds will definitely produce either a terribly watery or an awfully bitter coffee drink. The standard measurement is one tablespoon full of coffee grounds to 8 ounces of water. For a percolator, finely ground coffee do not yield good result. Coarse coffee grounds produce much better brew. So next time make sure you have medium-sized coarse coffee grounds ready before uncoupling your percolator. This is usually a mistake with stovetop percolators. Electric percolators automate this process but for the stovetop percolator you are in control. And the ideal percolating time is 5-10 minutes. If you carefully stick to the above, you’ll experience a dramatic change in the taste and quality of your coffee. Do you want something more from your coffee maker than the ability to make great coffee? Do you want to stand out from the crowd with a coffee machine that gets as much attention from its good looks as it does from the terrific coffee that it makes? If this is you then welcome to my post about high-end coffee machines- I hope that it scratches your caffeine itch! How should I describe the ideal buyers? Well, these are discerning people who want something different, they are not your average buyer. In fact, I think that they have three key qualities. Firstly, they like a great cup of coffee every time. Secondly, they want a coffee machine which is a little bit different and unique. And finally, if necessary, they are willing to pay extra for the right machine. Talking Point: Your coffee maker won’t just be another forgettable gadget on a cluttered work surface. It will grab attention as a bit of eye candy or because of the exceptional coffee that it brews. Price: Yes, you guessed it. You will be paying more for these wonderful brewers than if you opted for something far more run of the mill. Complexity: A curse of an owning luxury coffee maker is that they provide you with more options, choices, and settings. Although many of the models in my comparison will allow you to push a button and wait for the coffee to brew, some of the models require you to be much more involved in the process. To be honest, most of these coffee makers in this post have been chosen primarily for their design- they look stunning. And apart from that and the fact that each model makes a great cup of coffee, these devices don’t have a lot in common. Which makes this section quite hard to write. After all, if this post was about espresso machines, in this section I would be waxing lyrically about bars of pressure or steam wands. But I have chosen a very diverse range of coffee makers that include an espresso maker, a French press, a cold press, a single serve coffee brewer and a drip machine. And so I am left with just two features to look out for. From a cold coffee brewer which wouldn’t look to out of place in one of Harry Potter’s classroom to a sleek vintage style espresso machine, these sophisticated coffee brewers are gorgeous to look at. From a French press that has two layers of glass to a machine that brews coffee at a perfect temperature of 200 degrees F and onto brewers that include built-in coffee grinders all of these machines offer that little bit extra from most of their peers. So, without any more hesitation, let’s have a look at our first high-end coffee maker. Imagine owning a personal cafe and waking up every morning to the stimulating effects of freshly brewed espresso. Wouldn’t that be pure bliss? If you are in agreement then the Breville Barista Express Expresso is a dream come true. This semi-automatic high-end brewer is beautifully designed with attractive stainless steel. And it performs just as good as more expensive espresso machines. Nothing tastes better than a cup of espresso brewed from freshly ground coffee beans, with an integrated conical burr grinder the Barista Express reduces coffee beans to grounds seconds before brewing. The built-in grinder with dose control allows you grind only your desired amount of beans and dose directly into a porta filter – for every cup. This adjustable dose (and even grind size) gives you the chance to brew a highly personalized espresso drink, one that suits your taste perfectly. The Barista Express is a machine designed for both a novice in espresso making and an expert barista as it comes with the option of automatic or manual operation. For the espresso lover with no experience in making espressos, with the pre-set espresso options you can make a single or double shot simply by pushing the right buttons. To ensure maximum extraction and awesome brew quality, two dual-wall pressurized filters regulate pressure. And the skilled barista who wants to explore and customize each cup, two single-wall non-pressurized filters give you the liberty to determine the grind size, grind amount and tamping temperature. For highly flavored and full-bodied espresso, a 15 bar pump and thermocoil heating system regulates water temperature while a flat shower head and pre-brew function ensure appropriate distribution of water throughout the coffee grounds. Aside from making exceptional espressos, this high-end coffee maker is as beautiful and sturdy as it looks. It’s made from high-quality materials, has an attractive stainless steel finish and 12 months warranty. It also has some exotic features. A cleaning kit and a clean me light which indicates when it requires cleaning. A stainless steel 360 degree swivel-action steam wand for lattes and cappuccinos. For safety, it automatically goes to sleep mode after an hour and shuts down after three hours. The Barista Express is designed to give you absolutely tasty cups of espresso and its easy-to-understand controls make you feel like a skilled barista just by using it. The presence of natural oils in your coffee brew gives it a rich and satisfying taste and drip coffee makers, unfortunately, cannot extract these oils. This makes a French press coffee maker more valuable than you may realize. And one that adds a sensual pleasure to the brewing process is the Hario Double Wall Glass Press. This beautiful French press from Hario uses the most simple and natural process of brewing coffee to produce delicious tasting cups of coffee. It simply allows coffee to steep in hot water before pressing it through filters made with durable stainless steel mesh and a tight seal to assure the total absence of coffee grounds in your drink, and releasing natural oils in the process. This coffee maker combines aesthetic and functional features to give coffee making a sensual feel. To ensure complete extraction of flavor, aroma and oils, it maintains a stable temperature during the brewing process and retains the temperature of the coffee drink for an impressive amount of time. This is made possible by its double-walled borosilicate glass which also cannot absorb any flavor or aroma. And the transparent glass body allows you to see the press in action, aside from that, it also makes it easier to pour the correct amount of water; an advantage it has over stainless steel French presses. This glass body has a capacity of 13.5 oz. which can be enough for about two persons. The designs of this high-end coffee maker include an all-natural two-piece Olive wood and a brown leather strap to serve as a handle for the press. The leather strap and most other parts are removable to aid in cleaning. For this French press, maintenance is ridiculously easy as the double-walled heat-proof glass body is dishwasher safe. And for the stainless steel filter, base and mesh, simply unscrew, rinse with a generous amount of water, screw back and keep carefully for later use. The Hario Double Walled Glass French press is an impressive and classy coffee maker specifically designed to give your taste buds a thrill. Starting your day with a powerful cup of coffee is a simple way to make your senses come alive. And you shouldn’t have to wait too long for this refreshing drink, especially during the morning rush hour. The Moccamaster KBTS, a high-end coffee maker combines speed and temperature to give you a great tasting cup of coffee. It automatically brews your favorite tasting drip coffee at the optimal temperature of 200°F and within only a few minutes; between 4-6 minutes. A machine exquisitely crafted in the Netherlands, it adorns your kitchen with its elegant look. The KBTS coffee maker features a water reservoir with a capacity of 32oz, which gives you 8 cups of coffee. This water reservoir is transparent and calibrated allowing you to measure the exact amount of water you need. To ensure absolute extraction of flavor from the coffee grounds, this machine uses a 9-hole spray head to evenly soak up the coffee while brewing. For a perfect tasting drip coffee, brewing at an optimal temperature is essential and this machine has a high power heating element made from copper specifically designed to brew at the ideal temperature of 200°F and maintains this temperature from start to finish. This particularly great feature ensures your coffee is nothing short of perfect. Once the brewing cycle is complete and the water reservoir is empty the heating element automatically shuts off the machine leaving only the power button on to indicate that your brew is ready. It also comes with a stainless steel thermal carafe which keeps your coffee hot for about an hour. And to retain its temperature for longer hours simply switch to the included travel lid. Another great feature is its manual adjust brew basket, a toggle switch allows you to control how fast the coffee flows into the carafe. In addition to the above great functions, Moccamaster KBTS is very easy to use and its simple and detachable designs let you clean it with ease dislodging any residual particles that may affect the brew quality. With a 5-year warranty and highly durable materials, this high-end coffee maker is built to keep giving you powerful cups of the coffee year after year. Any enthusiastic coffee lover knows nothing tastes better than coffee brewed from freshly ground coffee beans. And for that perfect tasting brew, a perfect coffee maker is required especially one with grind and brew features. With a powerful built-in burr grinder, the Cuisinart Burr Grind and Brew coffee maker automatically reduce fresh coffee beans to grounds before fully extracting its aroma and flavor during the brewing process. This high-end coffee maker is a 24-hour fully programmable brewer and brews up to 12 cups of great tasting coffee. To brew a perfect tasting cup of coffee, the coffee flavor has to be completely extracted during the brewing process and this is only possible if the beans are ground to the ideal size just before brewing – not too coarse and not too smooth either. With a preset optimum medium grind, this gadget ensures absolute extraction of flavor and aroma. Its built-in burr grinder also has a grind-control feature which lets you choose the exact amount of beans to grind depending on the number of coffee cups you need – usually between 2 to 12. Another great feature is the ability to choose the strength of your brew, a strength selector button allows you to choose between strong, medium or mild coffee giving you the exact brew quality you need anytime. And even more exciting is its water filter, since coffee is predominantly water the quality of your coffee drink is also affected by the quality of water. This means bad tasting water equals bad tasting coffee. To avoid this, the Cuisinart Burr Grind and Brew has an added Charcoal water filter which removes all traces of chlorine, odors and bad taste brewing you a perfect cup of coffee with perfect water. This high-end coffee maker not only brews coffee from freshly ground beans but can also brew from traditional coffee grounds. To do this, simply turn off the burr grinder by pressing the Grind off button before turning on the brewer and brew using traditional coffee grounds. With this coffee maker, you need not to worry about forgetting to shut it down because it automatically shuts down after 30 minutes. The fully automated bring and brew comes with a measuring scoop instruction manual, a troubleshooting manual, and three years warranty. If you truly enjoy cold brewed coffee and wouldn’t mind brewing it yourself every once in a while. Or you’re looking for an exotic piece which doubles as a coffee maker, either for your house or your coffee shop. The Yama Cold Brew Drip Tower is as classic and stylish as a coffee maker gets. This stunning high-end coffee maker almost looks nothing like a coffee machine. With looks that belong more to a laboratory than a kitchen, it astonishes you with great tasting cold brewed coffee. It is designed to have four non-porous borosilicate glass jars fit into a wooden tower. From the topmost jar to the bottom jar this coffee maker delicately and slowly brews you a smooth and acid-free cold-brewed coffee drink. To start the brewing process, cold water and ice cubes are placed in the topmost glass jar which acts as a cold-water reservoir and the coffee grounds are placed in the following glass jar. Cold water from the water reservoir drips into the cylinder containing coffee grounds, liquid coffee escapes through a permanent ceramic filter and drips into a spiral glass tube, the cold brew eventually collects at the bottom of the final glass jar. The process is slow and thorough reaching up to 3-4 hours and the resulting cold brew is smooth, acid-free and truly refreshing. The ice cubes maintain the cold temperatures throughout the extraction and brewing process ensuring a smooth and acid-free coffee drink. The cold water reservoir has an adjustable valve at its bottom to control the drip frequency ( preferably 1-1.5 seconds) which in turn controls the boldness of the brew. Since a brewing cycle lasts for a few hours and requires the coffee grounds to remain immersed in water for long, fine grounds will give a bitter drink. Therefore, a tasty and flavorful cold-brewed coffee will require coarse coffee grounds. This classy high end coffee maker has a capacity of 32 oz. and the bottom glass decanter has a lid so your cold brewed beverage can be covered and stored in your refrigerator for up to two weeks. Also, the glass jars are non-porous and do not absorb flavor or aroma ensuring your brew quality remains unchanged. As a passionate coffee lover, a handy coffee machine capable of satisfying your coffee craving just as they come should be ever readily available on your kitchen counter, office desk or bedside table. And that ideal handy coffee machine should be reliable, easy to operate and gives you wonderful results in seconds. The Keurig K250 is a coffee maker with handy designs and the amazing features of a reliable and portable brewer. This slim and sleek machine is a single serve coffee maker designed to produce smooth, rich and great tasting coffee drink after every brewing cycle. And you can have your favorite brew-styles; either flavored coffee, decaf, mild or even strong coffee. You can give the K250 brewing instructions via a two-inch touch screen which is super easy to operate and smoothens your brewing experience. It has a 40 oz. water reservoir which will provide you with 4+ delicious tasting coffee cups, allowing for multiple cup refills before another brewing cycle. And each brewing cycle takes less than a minute. The water reservoir can be removed, this makes refilling it stress free. This concise unit comes with 4 K-cup pods, a water filter handle plus two water filters and a bottle of descaling solution to aid proper maintenance and elongate brewer’s lifespan. The K250 offers a lot of brew size flexibility as it is compatible with 4 different pod sizes; K-cup, K-vue, K-mug, and K-carafe. It’s also compatible with the Keurig Plus Series My K-Cup Reusable Ground Coffee Filter. With a small countertop footprint, this coffee maker can easily be described as portable and looks incredibly good despite being made of mostly plastics. This brewer also has a strength control setting which allows determining the strength and boldness of your brew with any K-Cup brew size. Provided it’s properly maintained and cleaned regularly, Keurig K250 has a fairly long lifespan. Descaling the machine using the provided descaling solution is a good and recommended maintenance practice. This simple coffee maker is available in a variety of bright colors – red, white, light blue, black and lots more. With its beautiful design and impressive features, Keurig K250 can easily pass as the best K-Cup coffee maker. An easy way to kick the habit of always hitting the snooze button of your alarm clock is to get a super performing single serve coffee maker. If you’re in doubt, try it. And just any single serve coffee maker wouldn’t do the trick. A simple and straightforward machine that produces amazing results is more like it and the Breville Nespresso Creatista is one to go with. Impressively designed in attractive shinning silver, this coffee and espresso machine produces your favorite café beverages (both black coffee and milk-based recipes) only by simply popping an Original Nespresso capsule and pressing a button. And with an attached milk frother you can comfortably create high-quality Latte art in your kitchen. It features more than five beverage selections; Luongo, Ristretto, Espresso, Cappuccino, Flat White, Café Latte, Latte Macchiato, with this exotic piece your home transforms to a coffee shop and you become a skilled barista – almost like a fairy tale, right? And there are settings that allow you to adjust coffee volume, milk temperature and mixture with a fast 3 seconds heat-proof time. And to create iced drink simply pour the drink over ice. To ensure complete extraction of flavor and aroma from coffee capsules, a 19-bar high-pressure pump rapidly heats up to an ideal brewing temperature – in just 10 seconds – this produces a barrister-style brew every time. This high-performance pump automatically shuts down after 9 minutes to conserve energy. The Nespresso Creatista also features a high-resolution display to lead you through all the settings, preparation, and maintenance. To help you make your favorite coffee and espresso beverages, its added milk frother is automatic with 11 different milk temperature settings and 8 texture levels. A Nespresso Original capsule welcome kit containing different capsules with unique aroma profiles is present in each machine as a complimentary gift. The Creatista has a water tank of 1.5L capacity, a stainless steel barista milk jug, an auto-purge steam process, and a fast cleaning process. Its amazing features coupled with a 2-year warranty from its manufacturers make the Nespresso Creatista hit the mark for the best coffee and espresso machine. 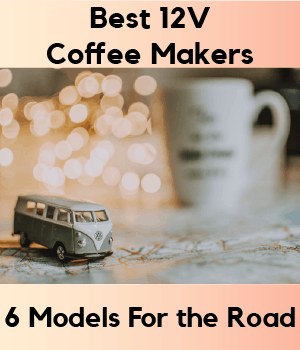 12V coffee makers are devices for caffeine loving nomads- people who spend their working lives or love to spend their spare time driving around in a car, RV or truck. And of course, they are addicted to coffee and can’t wait till the next service station for a cup of coffee. No, 12V coffee makers are for people on the move who have separation anxiety unless they are within six feet of a coffee maker. They are just like other drip coffee makers but they tend to be a bit smaller, simpler and instead of having a 110V plug on the end of a power cable, 12V coffee makers have an adapter that fits into a 12V socket or cigarette lighter in a vehicle. To be honest, I can only think of 1 advantage that 12V car coffee makers have. Convenience: For those nomads who cannot bear to be parted from their next caffeine fix, these coffee machines allow you to have a constant supply of coffee when you are on your travels. On the flip side, in car coffee makers seem to be to have plenty of drawbacks. Here are my “bottom” four. Expensive: As these coffee makers cater to a very special market, they are much more expensive than standard coffee makers. Feature Poor: Forget making a latte using a machine with a steam wand whilst “on the go”. 12V coffee makers have no bells or whistles. Slow: Because these coffee makers are powered by 12V and not 110V, you will have to wait much, much longer for your coffee to brew. Having said in the last section that these coffee makers for RVs are “feature poor”, just what are some of the features that you can expect to get? Well from looking at the six machines that I reviewed, here are six features that you will find. This hardly needs to be explained but boil dry protection, is an auto shut off feature that prevents your portable coffee maker from boiling dry. Brewing a full pot but you want a coffee now? Brew pause allows you to pour a cup of coffee midway through the brew without hot coffee dripping everywhere. Once the carafe is replaced, brewing can continue. This is special! One of our in-car coffee makers can be powered via a 12V adapter and a traditional 110V adapter. Very flexible indeed. Having a reusable filter is very handy in all situations. After all, paper filters are a pain to use, dispose of and remember to reorder. And nowhere is this more true than for people on the go. If you truly want to be able to brew coffee on the move then a mounting bracket is a very important accessory? How else will you ensure that with all the bumps, holes and curves in the road that your brew won’t end up all over you and your car or campervan interior? In a list of pretty basic functions, one of the machines in my comparison does offer a luxury option- the ability to use Nespresso Pods. This is great for all of the Nespresso fans out there. If you’re a caffeine addict and an avid road-tripper or truck driver, you might be missing fresh, home-brewed coffee. Instead of settling for gas station coffee (or no coffee), it might be time to invest in a coffee machine you can take and use on the road, like the RoadPro RPSC-784. The RoadPro RPSC-784 plugs right into your 12-volt outlet in your car, making it a portable and convenient choice. This portable coffee maker is mid-range in price. However, with a majority of negative reviews, it is clear this coffee machine is a dud. Buyers of the RoadPro RPSC-784 are all in agreement that you should stay far away from this piece of junk. They note that it takes 15-20 minutes to make a cup of coffee, and that the coffee turns out lukewarm at best. Even more concerning is this machine’s durability. Many users note that the plug becomes too hot and stops working after a few months. Some even say that the machine has fried their cigarette lighter plug, rendering it useless as well. Besides the volt plug-in, there are no features that make this coffee maker stand out from the rest. It is perfectly traditional, with a black and stainless steel color scheme and your typical brew basket on top and carafe on the bottom. A carafe that doubles as a travel mug for ultra convenience. No more transferring it from carafe to cup or cup to mug. If you’re a coffee lover looking for a caffeine fix when you’re on the road, the RoadPro RPSC-784 is not your solution. If you’re feeling an itch to travel and hop into your car, RV, or boat, you might be worried about your coffee prospects when out in the great wilderness or sea. Rather than just winging it, purchasing a Max Burton Coffee to Go 4 Cup machine that has a 12-volt plug can ensure that your coffee goes wherever you go. The price of this machine is average. With very low ratings and a relatively small buyer base, the Max Burton Coffee to Go 4 Cup is not anyone’s first-choice when it comes to portable coffee machines. People’s biggest complaint about this machine is the brew time. There are varying accounts of how long it takes to brew a cup of coffee, with reports ranging from half an hour to a couple of hours. For most people, the brew time is simply not efficient. In addition, this machine does not hold up well over time, breaking after a few weeks or a few months. Buyers state that this product is not worth the money. With black plastic and a glass carafe, the machine may appear a bit dated compared to the modern coffee makers of today. However, in general, the machine’s design is traditional and unsurprising, which appeals to a large group of buyers. Brewstop that allows you to have a cup of coffee without waiting for the entire pot to brew. 4 cup capacity so you have enough coffee to last you your entire day. Mounting bracket in case you need to mount your machine to a wall or cabinet inside your RV or boat. Reusable mesh filter so you don’t have to bother purchasing paper filters. For on-the-road or on-the-sea travelers, this machine does not make finding coffee any easier. It would be best to look elsewhere for a portable machine. With a 12 Volt plug, the Schumacher 1229 is a travel companion that you can take in the car. You will never be too far from a cup of a coffee with this machine, which makes it perfect for frequent travellers and campers. In regards to price, the Schumacher 1229 is mid-range. But aside from it’s reasonable price, there is very little positive feedback about this machine. It has proven to be very unpopular amongst its buyers. Buyers are unhappy with the low quality of the machine as well as its lengthy brew time. This machine has been said to overheat and break after a short period of time, occasionally shorting out a car’s cigarette lighter plug in the process. In addition, the long brew time of this machine means that users are not actually saving any time by brewing their own coffee. The machine falls short of its primary function–adding convenience and portability to your coffee routine. The design of this machine resembles the classic Mr.
Coffee coffee maker that was a star back in the day. With that being said, the machine’s bulky coffee basket and carafe doesn’t exactly look very travel-friendly. In fact, the bulbous nature of the machine might make it difficult to carry around. Boil dry protection that prevents coffee from burning and drying in the carafe, which means clean up is fast and easy. Anti-drip valve so the coffee doesn’t spill onto the burner plate and make a mess. 10 cup capacity that is enough to satisfy an entire family’s coffee needs. The Schumacher 1229 is not well-suited for anyone’s needs unless you’re looking for a hunk of plastic. We all know some mornings involve a mad dash out the door without your coffee mug in hand. Rather than trying to tough out your workday without caffeine, the Revelux Electric Portable Espresso Coffee Maker can do the work for you, brewing a strong shot of espresso while you’re driving. It’s the perfect addition for people who want to use their driving time more efficiently. In comparison to other portable coffee makers, the Revelux Electric Portable Espresso Coffee Maker is high in price. While this product hasn’t gained a huge following, it’s small base of customers have given it glowing reviews. Buyers rave about the delicious, full-bodied espresso that this machine makes, comparing it to the quality of a “real” espresso machine. Buyers also cannot get over the convenience of this machine, stating its portability has saved them time and money on long drives. Resembling the top part of a coffee grinder, this machine is sleek and compact. Its ingenious and modern design includes a capsule holder and a cup that can be accessed separately and put back together. This means there are no tiny pieces to worry about keeping track of or losing. This machine was also made to fit snugly inside your cup holder. 15 bars of pressure that is comparable to high-end espresso makers you might find in your local coffee shop. Nespresso capsule compatibility so you don’t have to fumble around, trying to load grounds into the machine. A fully automated process that brews coffee with the touch of a button, allowing you the freedom to drive while the machine does all the work. Detachable cup so you don’t even have to worry about packing a travel mug with you. You’ll never be in a coffee cup bind again. This portable machine is perfect for coffee addicts who can’t go without their coffee on a long drive and for people with crazy mornings who want to make the most of their commute. For adventurous coffee lovers who never want to be without a cup of coffee, the travel coffee maker is the answer to your prayers. With the capability to brew coffee in the car and then be taken on the go, this machine is perfect for hikers, campers, and everyone in between. The Travel Coffee Maker is on the higher end of the price scale. A relatively unknown product, this espresso maker has received generally positive reviews. It’s difficult to gauge its popularity, due to the small number of reviews, but so far buyers have not pointed out any huge issues. The majority of buyers love the convenience of this coffee maker, stating it makes steaming hot espresso in a flash. It is perfect for people who are always on-the-go. While there is a complaint concerning a possible defect, it doesn’t appear to affect every buyer. Most people are satisfied with their purchase. Smooth and pocket sized, this espresso maker can easily fit in a pocket, travel bag, or cup holder. The machine features a screw off cap and removable pod-holder, keeping the cylindrical gadget sleek and seamless. One button operation to keep the process simple. Dispense as much or as little espresso as you desire. Detachable cup so you won’t be caught without a coffee cup ever again. Nespresso pod compatibility for extra convenience, just pop it in and voila! Traveling businessmen and outdoor wanderers can finally agree on something — this portable coffee maker! If you need espresso on demand and on-the-go, you should keep the Travel Coffee Maker in your back pocket (literally!). There are few truly “portable” espresso machines that don’t leave you tethered to a cord or a power source of some kind. The WACACO Nanospresso changes the game. Completely manually operated, you don’t have to worry about finding an outlet with this machine, which leaves you free to roam without any worry that you might not have access to caffeine. The WACACO Nanopresso means more than just portability, it means freedom to have your coffee where you want it. This machine’s price is not quite average or expensive. Compared to similar products, it falls somewhere in between a mid and high-range machine. This portable espresso machine has racked up positive reviews from its buyers. Beyond the convenience of this machine, buyers love the taste of the espresso. They state it is comparable to espresso created the “traditional” way, yet this machine offers far more portability. Even though users aren’t fans of the cleaning process, it does not detract from their love of the machine itself, proving that the positives of this machine greatly outweigh any minor negatives. Forget everything you think you know about how an espresso machine should look. We can probably guess the image you conjure up: a bulky steel machine full of knobs and levers. The WACACO Nanopresso rejects any idea you might have about a “traditional” espresso machine. This espresso machine fits in the palm of your hands and has absolutely no knobs or levers to be found. Its design can be described in one word: simplicity. All of its components fits neatly into each other, meaning what you’re left with is a tiny espresso machine that you can throw into your go-bag. The power of a traditional espresso machine, which includes 18 bars of pressure. An included cup for added convenience. A weight of just 336 grams, the lightest handheld espresso machine ever. Pod compatibility so you don’t have to pack coffee grounds on your trip. Large cup capacity so you can make more than one shot of espresso. If you’re a coffee addict that’s looking for a handheld, completely portable machine, the WACACO Nanopresso is for you. You’re looking for a home espresso machine, but you’re not quite sure if it’s worth the investment or you maybe have a tight budget. Either way, you don’t want to break the bank, but you still want value for money. Here, we’ve rounded up 14 reliable espresso machines that will cost you less than $200. And I have split them into 2 sections- machines that are $100 or less and machines that are $200 or less. So, what can you expect from an espresso maker that is $100 or less? Think plastic finish, simple operation with a few buttons, 15 bar pressure, a steam frother and removable water reservoir. This reservoir is usually removable and easy to wash, but the size does vary depending on the model. This sleek black and silver kitchen-sized wizard makes the perfect cappuccino, latte or espresso, every time. Equipped with a frother and patented dual function filter holder, you can make every cup to your liking, even back-to-back if you want. The filter holder allows you to make either one or two cups at a time, whatever strikes your fancy in the moment. At 15 bar pressure and rated at 120V, it has two thermostats, one to control steam temperature and one for water temperature. This means that the water and steam temperatures stay perfect, so you don’t have to wait for it to re-heat after every cup. This bad boy self-primes, eliminating start-up hassles. It’s also super easy to clean, has dishwasher friendly parts and a removable water tank for even greater convenience. If you like your espresso strong enough to take on a steal tank, have no fear. De’Longhi EC155’s filter holder allows you to double up on espresso shots if you want. You also have the option of using espresso pods. Adjustable controls cater to your personal taste with the turn of a dial. Not much space in your kitchen? This space-saving design is meant for the home-barista with a tiny kitchen. If you want personalized, barista-quality coffee in the convenience of your home, De’Longhi EC155 is the product for you. This professional, black and silver brewster prepares perfect espressos, right in your kitchen. Mr Coffee Dual Shot Espresso is able to prepare two single-shot espressos simultaneously, in basically no time at all. If you’re into lattes and cappuccinos, the frother arm would make your life super easy. Speaking of easy, this one is really easy to fill up and clean. The water tank and drip tray are removable, so you don’t have to feel like an amateur lockpick trying to clean hard-to-reach corners with fiddly little tools. At 1250 Watts and equipped with a heating block system and 26-inch chord, this one will take your kitchen to the next level. You’ll also get a tamping tool and recipes, so you’ll never be out of ideas when wanting to impress your visitors. If you want single-shot beverages prepared in the blink of an eye, the Mr. Coffee Dual Shot Espresso is ideal for you. The Bella personal espresso maker is perfect for your office or small kitchen. Compactly designed to fit small spaces, yet sleek and stylish, it’s the best way to be your own personal barista. Equipped with a steam wand to turn those espressos into cappuccinos, your coffee breaks will never be the same again. The glass decanter is clearly marked to help you judge the amount of water needed to prepare between one and four cups of the perfect brew. For your safety, this decanter comes with a heat resistant handle for easy pouring. The permanent filter basket is detachable for easy cleaning. No more disposable filters for your morning brew! As an added bonus, you get a coffee scoop, recipes, tips and product videos with your purchase. Want to brew your own personal espresso in your office or small kitchen? Try the Bella 13683 Personal Espresso Maker. You’re into perfect Italian coffee, but you can’t get to Italy weekend. Luckily, the Hamilton Beach Espresso Machine can take your taste buds to that awesome Italian street café with the perfect coffee. Able to prepare two cups simultaneously with its 15-bar pump, this black and silver wonder allows you to use freshly ground coffee beans or pre-measured espresso shots. If it’s lattes, mochas or cappuccinos you want, simply use the adjustable steam control to froth up the perfect foam in seconds. Lots of guests, all wanting a good cuppa right now? The easy-fill, removable reservoir can be topped up while the machine is in use, unlike some other machines. It’s really simple to use and clicks on to the back of the machine. After the guests are gone, you won’t have a hard time cleaning this one either. Basically, all the parts are removable and machine-washable for easy cleaning. If you want to brew professional quality coffee for your whole crew, right in your kitchen, the Hamilton Beach Espresso Machine is the one to use. You like camping but you simply cannot function without a good, solid espresso early in the morning. And seriously, those “just add water” packets taste like plastic. You’d rather brush your teeth with brambles. The Handpresso Wild is definitely the answer to your prayers. This portable espresso wizard works with elbow grease to deliver and impressive 16 bar pressure to deliver a perfect single-shot espresso. It’s 50-milliliter reservoir is perfectly sized for your awesome espresso. Suited for espresso pods or ground espresso beans, this sleek camping buddy comes in either black or silver and looks as awesome as your coffee tastes. If you’re a camping enthusiast in need of a daily high-quality caffeine fix, the Handpresso Wild is the one for you. Bialetti is the holy grail of easy, awesome coffee. This six-cup stovetop coffee-making miracle is ideal for Sunday afternoon when the family comes to visit. In true Italian style, this octagonal stainless-steel wonder helps you make the perfect mocha in new time at all. It’s easy to use and easy to clean and extremely elegant, so no hassles involved. You can use the Bialetti even if you’re living in the sticks, since it works equally well on gas and electrical stoves. No plugs, no chords, no risk of electrocution. Jokes! The others won’t electrocute you! For traditional, high quality coffee, choose the Bialetti Moka Express. You’re looking for a really nice, upper mid range espresso machine to satisfy your coffee craving at home. This is generally a sizeable investment, so you want to make sure that you know what you’re buying. Here, we’ve rounded up the best espresso machines for under $200. You can expect beautiful finishes and sleek designs coupled with simple operation and a few added features that you won’t find in cheaper models, like frothing jugs or cups included in your purchase, or super-fast heating or even a milk reservoir. The Mr.Coffee Café Barista Espresso is sleek in silver and brews great coffeehouse quality espresso, lattes and cappuccinos, without fail. This one doesn’t just have a water reservoir. It has a milk reservoir too! Now, you don’t have to guess how much foam to prepare or when the foam is actually ready. At the press of a button, the Café Barista Espresso prepares just the right amount of foam for your favorite beverage. Cool, right? And what about the leftover milk? That remains untouched, so you can put it right back in the fridge. One-touch controls give you the option of choosing a double- or single shot for your espresso, latte or cappuccino. It’s never been easier! The removable water reservoir is easy to clean, adding to the joy of using the Café Barista Espresso. If you want coffee that tastes like it’s been made by a world-class barista, right in your home, choose the Mr.Coffee Café Barista Espresso. This super sleek stainless-steel espresso wizard fits right into the beautiful kitchen of a coffee aficionado. Able to brew two cups at the same time, the De’Longhi EC702 allows you to brew single- or double-shot espressos, lattes and cappuccinos, back-to-back and perfect, just the way you like them. The EC702 has perfect temperature control and a large, removable water tank with level indicator, making your life easy. It also comes standard with a 15-bar pump and 1100 Watt power input. The 3-in-1 filter holder allows for versatile brewing, so you can serve multiple guests at once, or just brew the perfect cup for yourself, whichever is needed for the occasion. The frother arm makes perfect foam for your cappuccino. After impressing your friends with your barista skills, you won’t have any headaches cleaning up, since the EC702 is super easy to clean. Want to keep those cups warm while you’re preparing the rest of your order? The EC702 is equipped with a heating tray. If you’re into freshly ground espresso beans, simply scoop the amount you want into the filer holder. If that’s not your thing and you prefer the ease of espresso pods, you can use those as well. The De’Longhi EC702 is perfect for the stylish home barista with a taste for perfect coffee. This luxurious café wiz is the ultimate for home coffee brewing. It’s brushed stainless-steel surface is sleek and elegant, fitting right into a high-end kitchen or office. Able to brew two cups simultaneously, the Klarstein Passionata Rossa 15 Espresso Machine is incredibly easy to use. Its steam nozzle froths milk to perfection of lattes and cappuccinos and its reservoir holds enough water for 6 cups of awesomeness. While you’re brewing up a storm for your guests, their beverages won’t get cold, since the hot plate on the lid of your super-duper espresso machine will keep them at the perfect temperature. The removable drip tray allows for easy cleaning of this compact coffee companion. For a luxurious, elegant espresso machine that fits right into any stylish kitchen, pick the Klarstein Passionata Rossa 15 Espresso Machine. This deluxe brushed stainless-steel model will instantly make your kitchen so much classier. The guys at Breville take coffee seriously, even throwing in a dedicated stainless-steel frothing pitcher and tamping rod with your order. You will definitely look like a seasoned barista handling this beauty. The Breville ESP8XL has a 15 bar thermoblock heat pump, ensuring that the water temperature remains perfectly constant. It’s dual filter system and froth enhancer take your espresso, cappuccino or latte to the next level. If you like your coffee piping hot, place your cup on the cup warming plate before you use it. Or place your espresso there while you’re preparing a second cup. It’s 1.2L water tank allows you to prepare quite a few beverages before needing a refill. For professional coffee right in your kitchen, try the Breville ESP8XL. The AICOK espresso machine with milk frother is the perfect addition to you high end kitchen. With its brushed stainless-steel finish and 15-bar pump, you’re guaranteed a silky-smooth latte, cappuccino, espresso or latte, whatever you fancy. This coffee wiz comes standard with a 1050-Watt high power heater and automatic temperature control, getting the water temperature just right in record time and keeping it that way for your entire brewing session. The 1.25L removable water reservoir allows you to prepare the perfect brew for your entire squad. You won’t have to worry about getting carpal tunnel from all that brewing either, since the handle is ergonomically designed for your comfort and convenience. 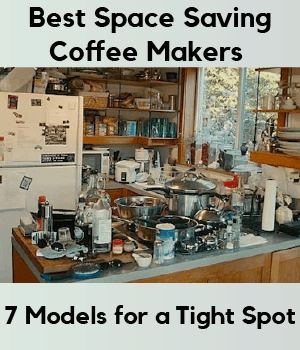 Do you want to show off your fancy new espresso machine in the middle of your kitchen counter? With its 26-inch chord, you can! AICOK even extends customer service past the 24-month warrantee – you get lifetime support from these guys! For silky smooth, fresh espresso right in our own kitchen, get the AICOK Espresso Machine with Milk Frother. The compact ECP3120 allows you to brew professional quality espresso, latte or cappuccino, right in the comfort of your own kitchen. And its nice to look at. Available in black or stainless-steel finish, the De’Longhi ECP3120 allows you to brew either one or two cups simultaneously with it’s three-in-one filter. You can also double up your shot or use easy-serve espresso pods, whatever you fancy. Temperature control is next level, maintaining the perfect water temperature so that you can brew many beverages back to back. The 15-bar pump and adjustable controls ensures that you brew your next cuppa just the way you like it. Want to use a taller cup? Just remove or adjust the bottom tray. Speaking of the bottom tray, this one is stainless steel. This, along with the water tank, is dishwasher safe for easy cleaning. For beautiful, personalized home brews, get the De’Longhi ECP3120. This deluxe espresso maker takes the guesswork and mess out of home brewing. Mr.Coffee has whittled home brewing down to three steps: scoop, slide and brew. How crazy is that? After scooping the desired amount of coffee grounds into the filter drawer, auto-tamping technology compacts it perfectly, giving you the optimal taste experience. The 15-bar pump extracts the caffeinated awesomeness that you crave while the milk frother gets you the perfect cappuccino foam. Do you want to use some of those giant cappuccino mugs? Remove the reversible drip tray and fit them right in. The brew functionality dial lets you brew exactly the right amount for your mug. These guys really thought of everything. The coffee filter drawer even has magnetic soft-close functionality, so you won’t make a racket when preparing your morning brew. Perfection has a new name: Mr. Coffee Easy Espresso Maker. This one must be the Rolls Royce of home brewing. As the name suggests, the All-In-One Espresso Machine & Cappuccino maker does it all, from grinding your favorite coffee beans to brewing the perfect beverage. You can start brewing within 45 seconds from switching on this beauty with its Thermoblock fast heating system. Wow! Choosing between single shot and double shot, you can now brew the perfect espresso, americano and macchiato. Using the stainless-steel milk frothing cup and frothing device, you can even brew amazing cappuccinos and lattes. 15 bar pressure ensures optimal extraction of flavors from your freshly ground beans. The electric coffee grinder is a 120 Volt plug-in device, perfect for your kitchen. The 1.25L water tank is removable for easy cleaning. It also has clear demarcations indicating the water level. Even the frothing device is easy to clean, since it’s removable! As an added bonus, EspressoWorks threw in two porcelain cups that you can heat in the nifty stainless-steel heating tray. For one-stop, freshly ground home brews, try the EspressoWorks 7 Piece All-In-One Espresso Machine & Cappuccino Maker.